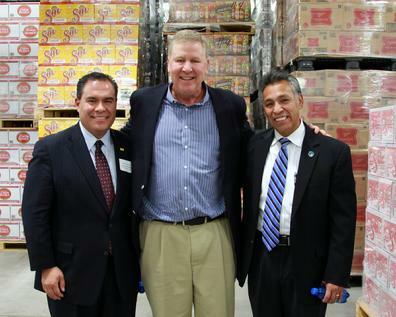 Senator Michael Padilla congrutulating Admiral Beverage as they opened their newest plant in the South Valley. 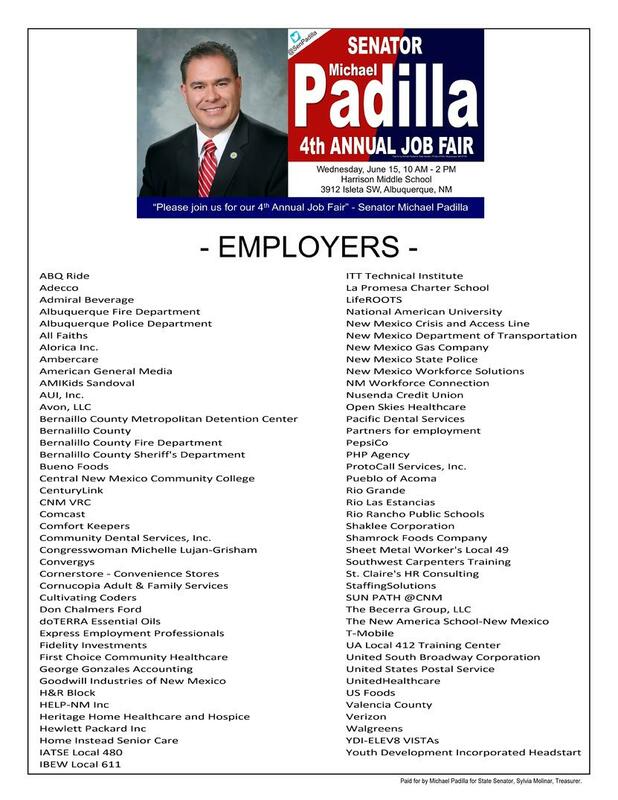 Over the past year Senator Michael Padilla served on the New Mexico Jobs Council, a bipartisan committee of the New Mexico Legislature, and we have completed our first year of work on a comprehensive job creation plan. 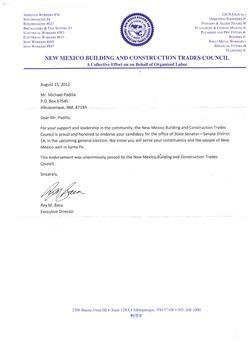 He was successful in gaining appointment to the New Mexico Jobs Council, and he promised during the campaign that he would focus on bringing jobs to his district. The Jobs Council plan addresses job losses since the economic downtown in 2008, and the projected job creation needs for the next ten years. This plan provides a clear path to what the state will need to do to create 160,000 jobs, to both stabilize the New Mexico economy and meet the needs of future growth trends. This plan was developed by both legislators and key individuals that can help achieve job creation goals. The plan addresses job creation needs by region, growth sectors where jobs currently exist, training and development needs, and specific steps the legislature can take to achieve these requirements. 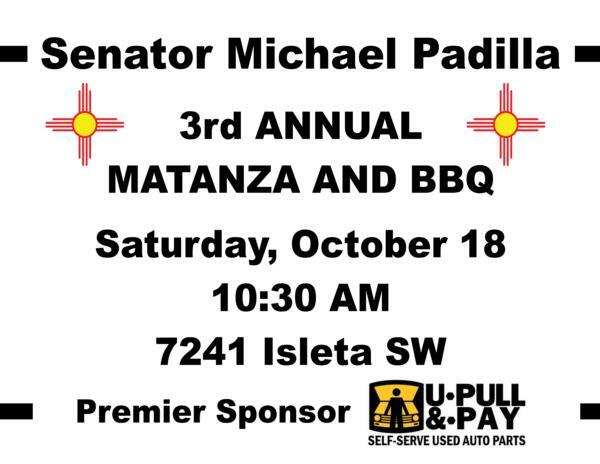 Over 600 people attened the 2nd Annual Senator Michael Padilla Matanza and BBQ held on Saturday, October 12, 2013, in Los Padillas, New Mexico. The event featured great food, mariachi music by the Atrisco Heritage High School Mariachi Band, a giant jungle gym for the kids, and traditional chicharrone cooking. Senator Padilla awarded his New Mexico Leadership Awards to Madison Maloney, a Rio Grande High School student body president and homecoming queen, Yvonne Garcia, principal of Rio Grande High School, and G. Antonio Gonzales, principal of Atriso Heritage Academy High School, now New Mexico's largest high school. 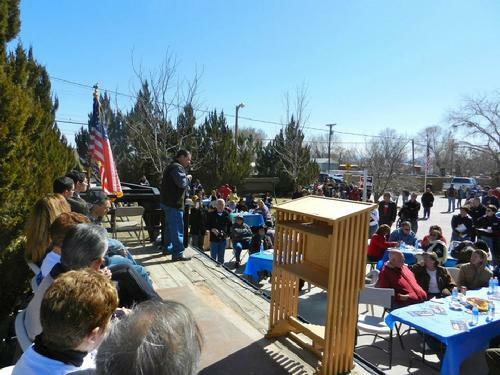 The event was held in the historic South Valley, at Los Padillas. 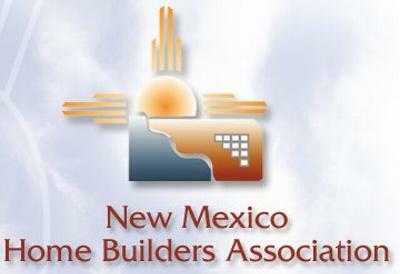 "I am thankful for the endorsement of the New Mexico Homebuilders Association" said Michael Padilla. 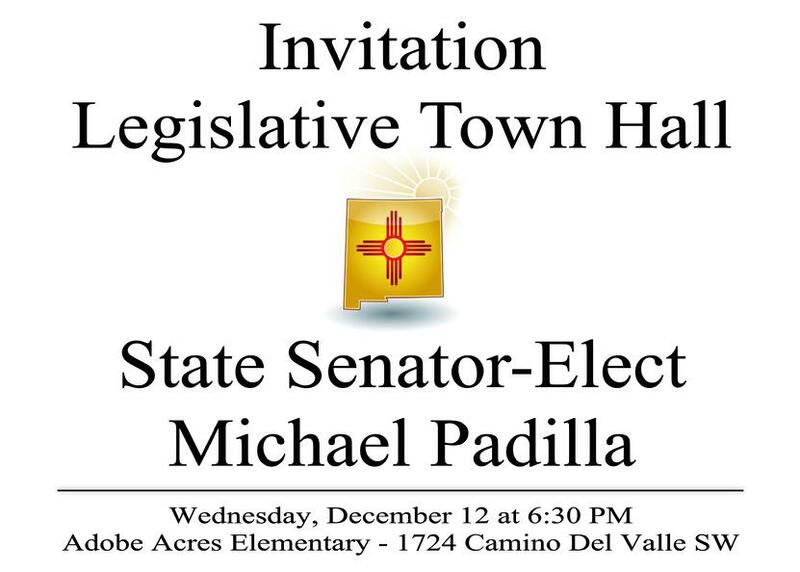 "I look forward to supporting the goals of IATSE New Mexico" said Michael Padilla. The All Indian Pueblo Council (AIPC) is comprised of the twenty Pueblos of New Mexico including the Pueblos of Acoma, Cochiti, Isleta, Jemez, Laguna, Nambe, Ohkay Owingeh, Picuris, Pojoaque, San Felipe, San Ildefonso, Sandia, Santa Ana, Santa Clara, Santo Domingo, Taos, Tesuque, Ysleta del Sur, Zia, and Zuni. Established in 1598, the AIPC has served as the political voice of the Pueblos of New Mexico. 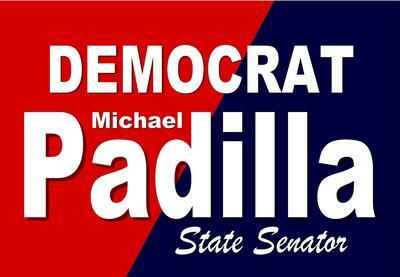 The AIPC has endorsed Michael Padilla for State Senator. "I am both proud and thankful for the All Indian Pueblo Council endorsement of my candidacy, and for the incredible work performed by this amazing group of people" said Michael Padilla, candidate for state senator in New Mexico's 14th district. St. Joseph Community Health's Celebrating Babies event at the Natural History Museum drew over 500 people. The event was held at the New Mexico Natural History Museum and included information and education on Early Childhood Education programs. Highlighting the evening were twelve toddlers who received graduation certificates from the program. 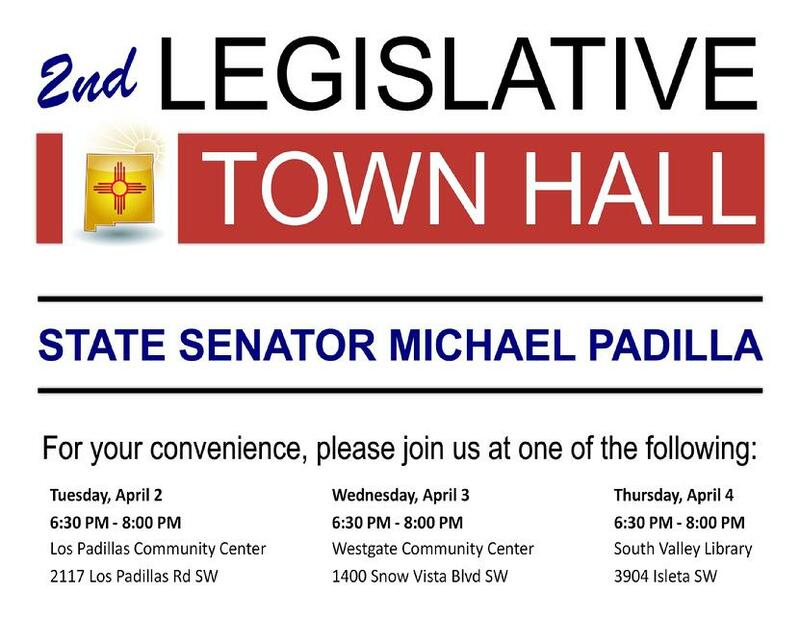 "I am 100% committed to Early Childhood Education programs and a Constitutional Amendment that could dramatically enhance early education across New Mexico" said Michael Padilla, candidate for New Mexico State Senator in district 14. 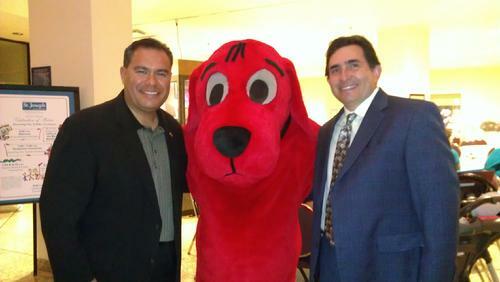 Michael Padilla and early childhood education advocate Miguel Gómez greeted Clifford, the Big Red Dog, as he joined in the celebration. 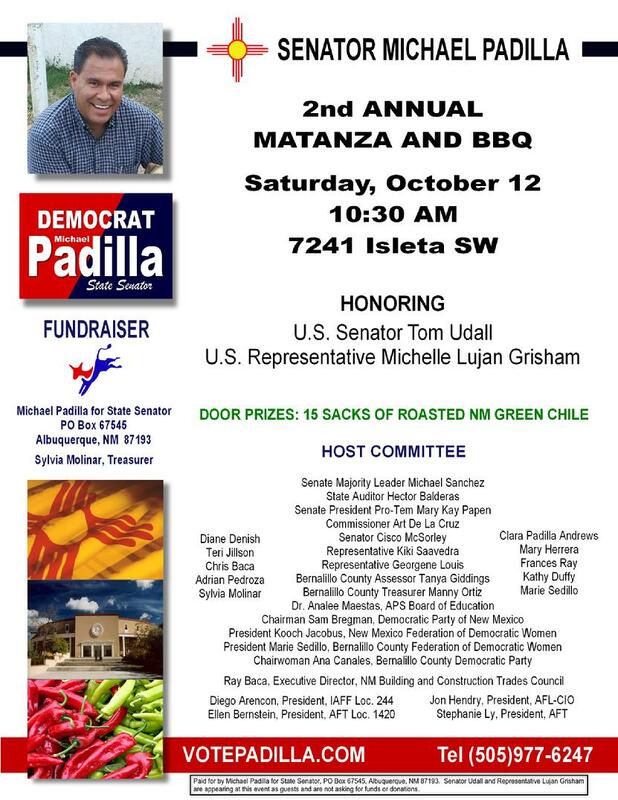 "I look forward to supporting the work of AFSCME and all unions in the state senate" said Michael Padilla, candidate for state senator for New Mexico district 14. 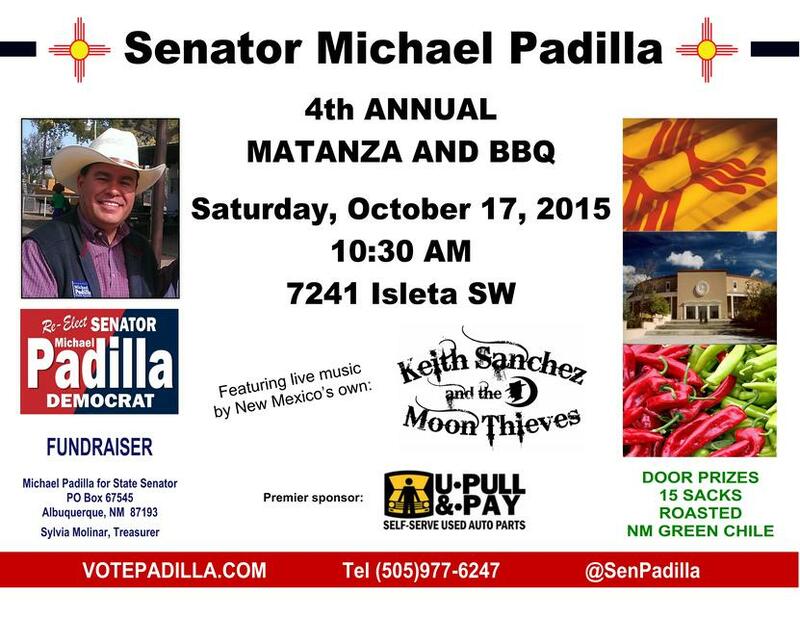 "I look forward to supporting the goals of Conservation Voters New Mexico" said Michael Padilla. 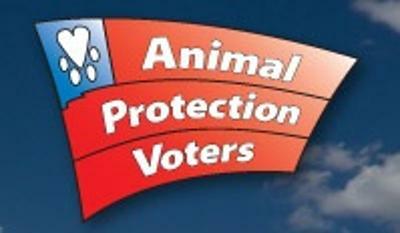 "I look forward to supporting the goals of Animal Protection Voters" said Michael Padilla. Michael Padilla toured the Cornucopia Adult Day Service Center in the South Valley and attended the 2012 Southwest Disability Conference with Michelle Bishop-Couch and her staff. Matt Dutton received the Advocacy Volunteer Award for 2012. Matt and his parents are some really great folks. 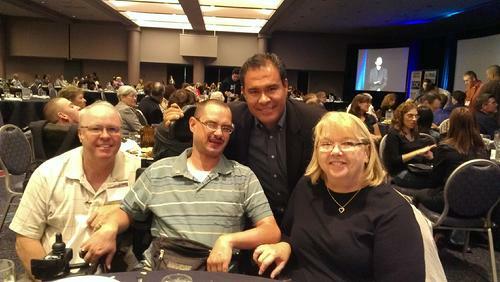 Michael Padilla said "I am very proud Matt Dutton and his tireless work on behalf of New Mexicans with disabilities." Cornucopia Adult Day Services is located at 2002 Bridge SW in Albuquerque's South Valley. 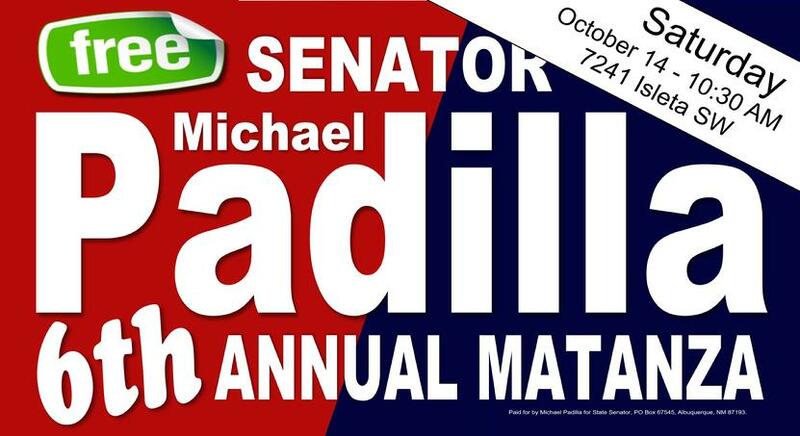 Special thanks to Michael Padilla's cousins Roy and Michelle Padilla for opening their home for a great matanza to get out the vote! Special guests included United State Senators Jeff Bingaman and Tom Udall, and Democratic Nominee for United State Representative Michelle Lujan Grisham. 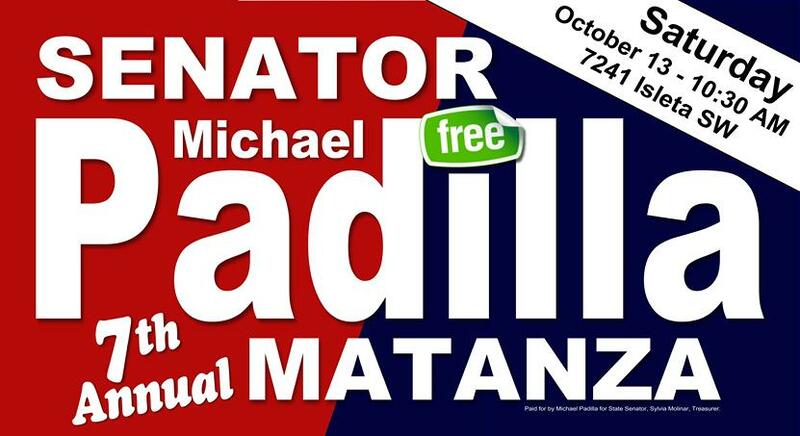 Early Voting begins Saturday, October 20. For more info call 243-8683 or online at BERNCO.GOV. Michael Padilla supported the 2012 Food Festival held today at the Gutierrez Hubbell House in the historic South Valley. The event attracted over 2k to the South Valley. 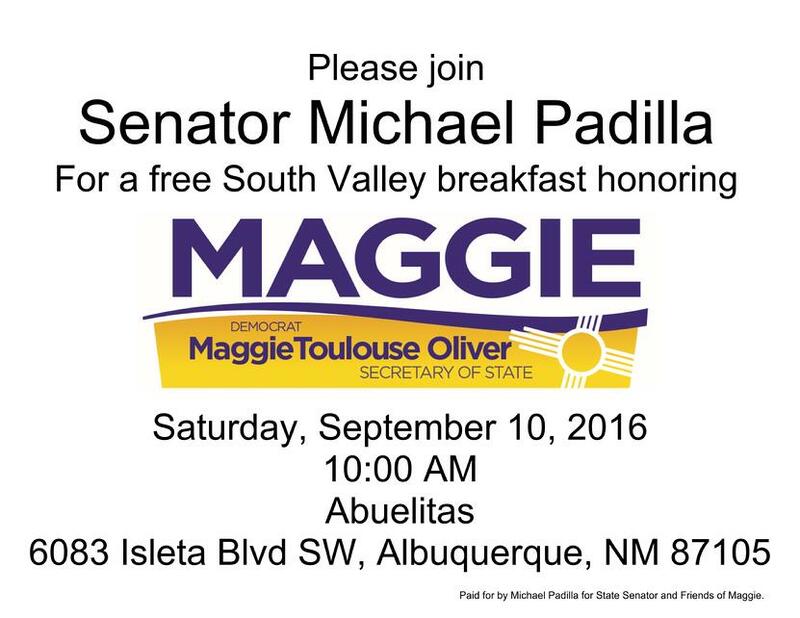 "Please come visit the Gutierrez Hubbell House to learn more about our rich history in teh South Valley" said Michael Padilla, candidate for state senator in New Mexico's district 14. "Today featured some great South Valley small businesses, the engine of our economy" said Michael Padilla. 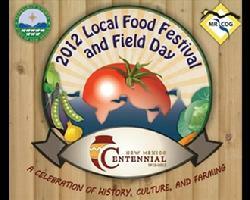 The Food Festival is now an annual event that will take place at the beginning Fall each year. 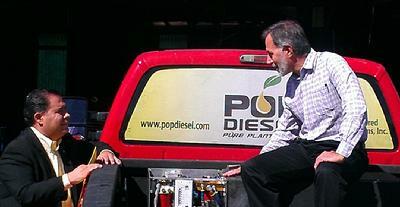 State Senate Candidate Michael Padilla toured Pop Diesel's South Valley production facility on Tuesday. 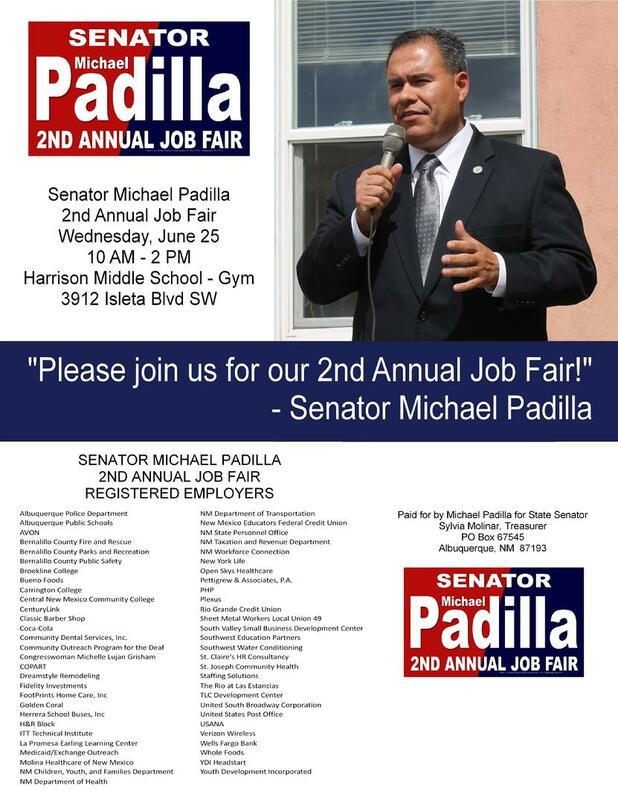 "I work tirelessly to promote the work of small businesses in the South Valley because our job creation potential is limitless when small businesses succeed" said Michael Padilla, Candidate for State Senator in New Mexico's District 14. Pop Diesel is a start-up that has engineered a way to produce 100% diesel from vegetable and other non-soluble vegetable oils. The plant is expected to generate jobs that could reach 400 within the next five years. The plant is located in the South Valley. 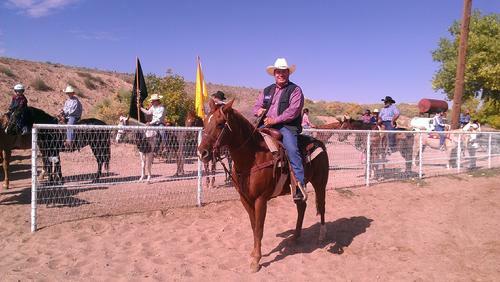 Over 100 youth participated in the annual South Valley First Impression Rodeo on Sunday, October 10, 2012. 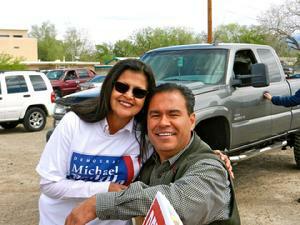 State Senate Candidate Michael Padilla attended the rodeo and road "Tornado" during the opening parade of riders. 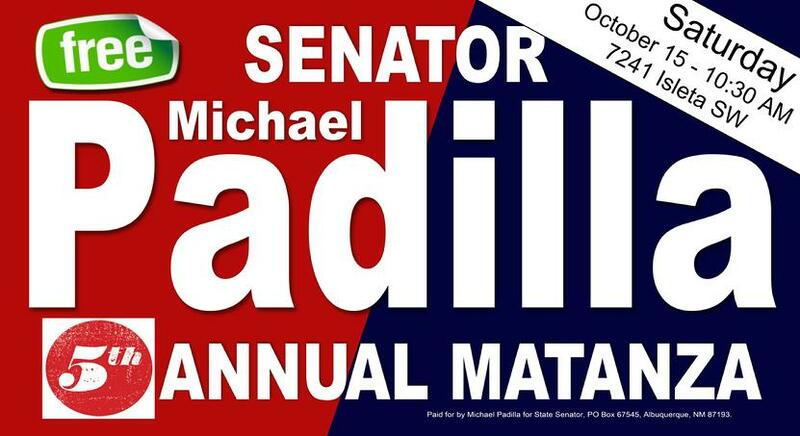 "The South Valley First Impression Rodeo provides our youth in the South Valley with an excellent way to connect with livestock and a great way to build a sense of pride in what they do and accomplish" said Michael Padilla, candidate for State Senator in New Mexico's 14th District. The rodeo lasts two days and is held several times a year. 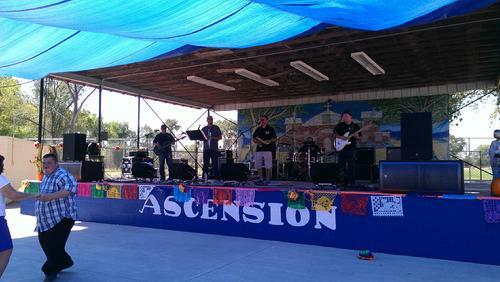 Ascension Catholic Church held its annual fiestas on Sunday, September 23. Over 1,000 parishioners and members of the community enjoyed fiesta burgers with goold old New Mexico green chile, snowcones, a cake walk, and great music. The community of Ascension Catholic Church is deep in the heart of the South Valley, and located in Los Padillas, where Michael Padilla grew up. Michael Padilla met with the Isleta Tribal Council at the Pueblo of Isleta Tribal Services Complex. Padilla met with the Governor of the Pueblo, Tribal Attorney, and the Tribal Council on issues important to the reservation, including taxation, water and natural resources, and sacred grounds that are important to the Pueblo. 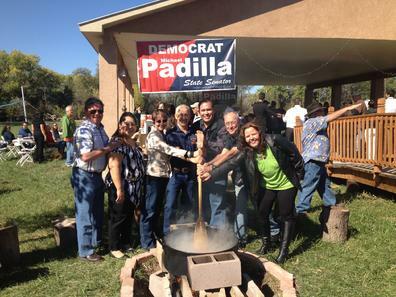 Padilla's family was instrumental in gaining voting rights for native Americans in the first part of the last century. Padilla presented the Tribal Council with a photo of his great-grandfather, Rafael Padilla, who is fought for an helped in voting rights for native Americans in Los Padillas, New Mexico. 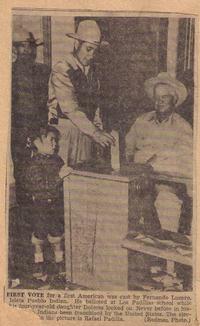 The photo depicts Mr. Fernando Lopez and his daughter being assisted by Rafael Padilla, as he becoms one of the first native American's in the U.S. to cast a vote. The photo was published in the Albuquerque Journal and other newspapers. 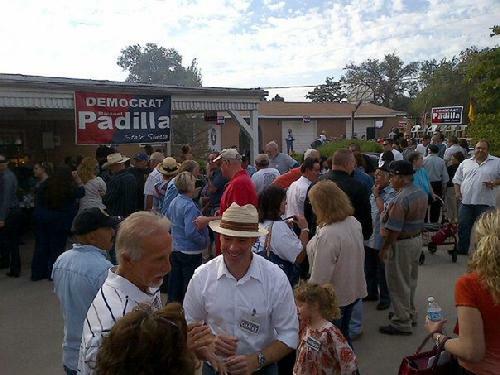 Over 400 people gathered in Los Padilla, New Mexico, to kick-off the campaign of Michael Padilla for State Senator. 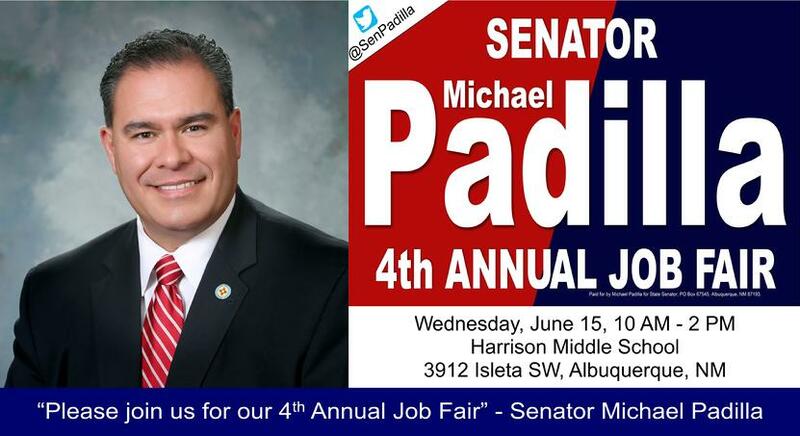 Michael Padilla is the Democrat nominee for State Senator in New Mexico District 14. "Wow, I was amazed by all of the support. 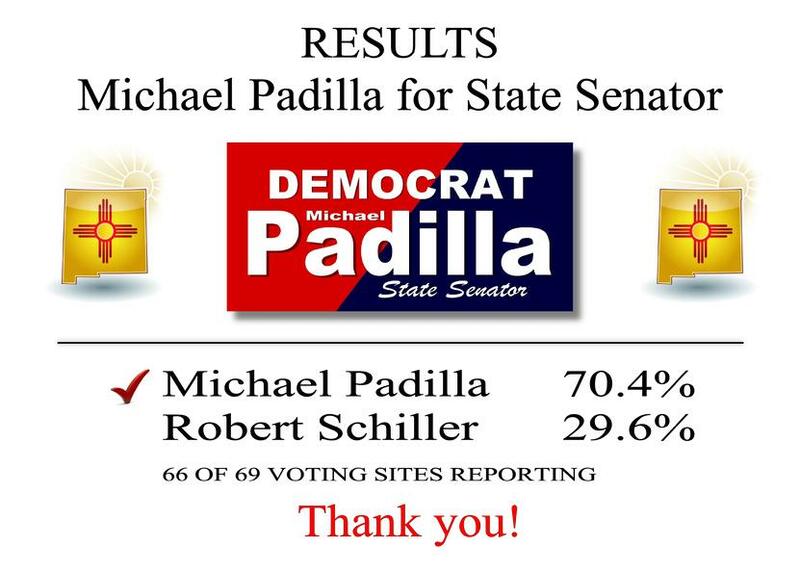 Special thanks to my family and friends for making all of this happen" said Michael Padilla, Candidate for State Senator in New Mexico District 14. 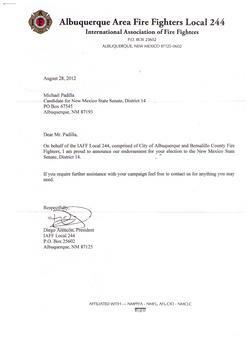 "I sincerely appreciate the endorsment from the Albuquerque Area Firefighters Local 244, as these are the hard working men and women who keep our community safe" said Michael Padilla, candidate for State Senator. Michael Padilla, democratic nominee for state senator in New Mexico district 14, meet with the Achbishop of Santa Fe, Michael Sheehan, to discuss Early Childhood Education funding in New Mexico. 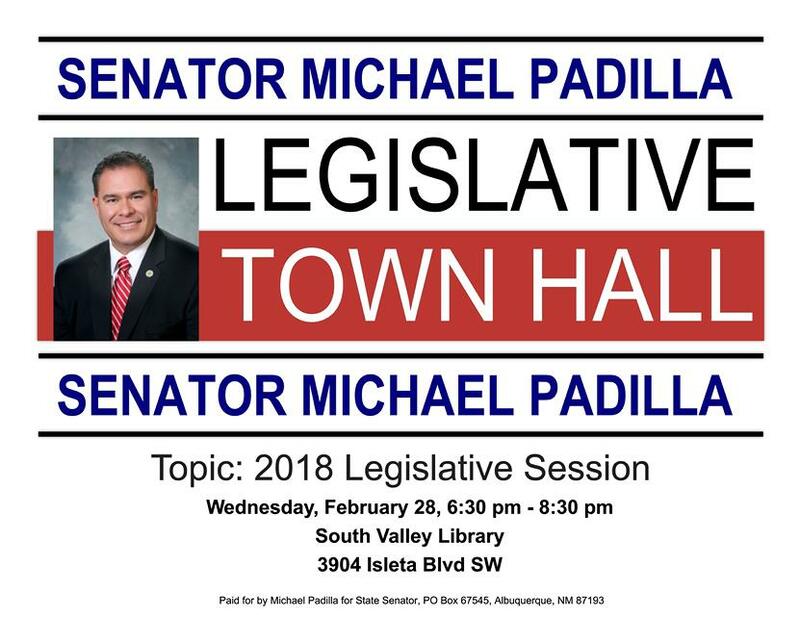 "I ran for state senator with the goal of focusing New Mexico on Early Childhood Education funding, and I intend to see it through in the legislature" said Michael Padilla. 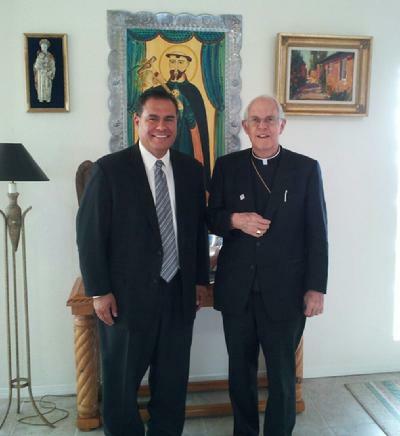 Padilla listened to the Archbishop discuss what he sees as one of New Mexico's most important issues in our lifetime. Early Childhood Education funding will help excite youth in their first few years about the prospect of gaining a good education, will help expectant mother's learn how to care for their children's academic and health needs, and can be a strategy that differentiates New Mexico's workforce for decades. "Early Childhood Education funding will help New Mexico's economic future by strengthening the skill sets of our workforce for decades" said Michael Padilla. I would like to thank you for your support, hard work, and passion for district 14. So many of our friends and family made significant contributions to our victory last night. We walked district 14 many times, shared our message through the mail, telephone, street corners, and many other ways. Our message to bring home jobs, build quality schools, and ensure that we get our fair share for working families made a huge difference. The energy and passion that was put into this campaign was exactly what I will take with me to Santa Fe. I would like to thank my opponents for their desire to serve and share their goals for our future. At the end of the day we are all New Mexicans. New Mexico has a real opportunity to get our children excited about learning at a very young age by properly funding early childhood programs across New Mexico. Simply by investing a very small portion of the state’s permanent land grant fund, this can become a reality. In this year’s legislative session there were two bills making their way through the legislature (HJR 15 and SJR9) that could have positively altered the face of New Mexico for decades. These bills would not only have had the impact of getting our children off on the right foot for the rest of their lives, but would have also had a lasting effect on our economy. This legislation would have pumped hundreds of millions of desperately needed new dollars into the struggling New Mexico economy over the next decade. In addition, the return on investment for high quality early childhood programs has conservatively been estimated by the Nobel Prize winning economist from the University of Chicago, Dr. James Heckman to be 10% per year, per child for the rest of that child’s life. The key objective of this legislation is to take a portion of New Mexico’s permanent land grant fund and commit it solely to high quality early childhood programs across the state. The fund itself will not shrink, only grow at a less rapid rate. The return on investment, however, will be enormous and have multiple positive benefits. In addition, this legislation has a sunset clause after ten years as well as multiple safe guards and mechanisms to stop this initiative if it is not achieving its objectives. This is good government and something that all business people should fully embrace. As a business owner, I’ve supported numerous economic development initiatives funded by the State. Some have proven successful and others have been complete failures. 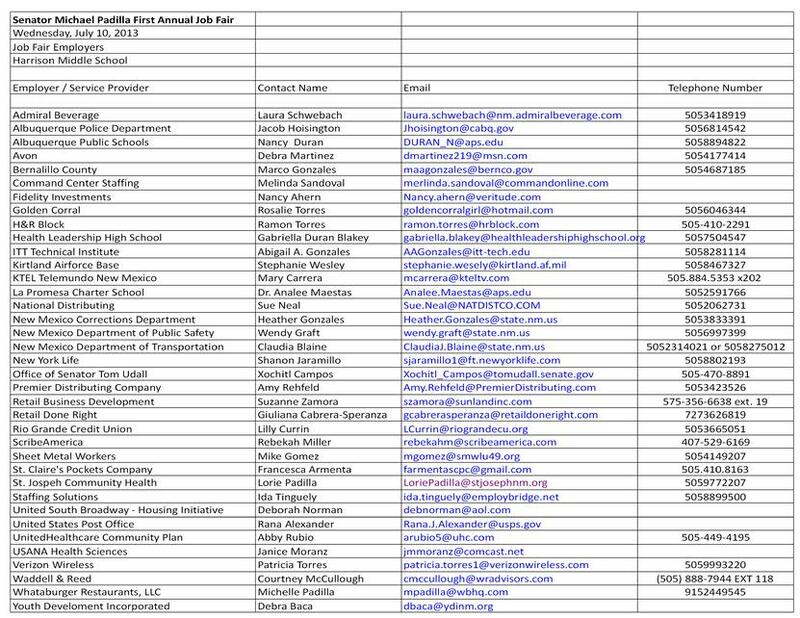 Many of these programs have focused on tax breaks for large out-of-state corporations that promise new jobs. Unfortunately, the jobs never seem to materialize in the numbers promised and often don’t last more than a few years. This legislation will create jobs for decades because we begin to truly develop a quality workforce from the earliest opportunity, which will ultimately help New Mexico become significantly more competitive when it comes to recruitment of new business to New Mexico. Companies are looking for the best and the brightest workforce and this legislation will develop such a workforce across New Mexico, not for the short run, but for generations. Other positive residual effects of this legislation will be reduced dropout rates, increased earning potential for future generations, reduced crime and many others community benefits. Governor Martinez and the Democratic legislature should work together in a bi-partisan fashion to make this a reality as soon as possible. 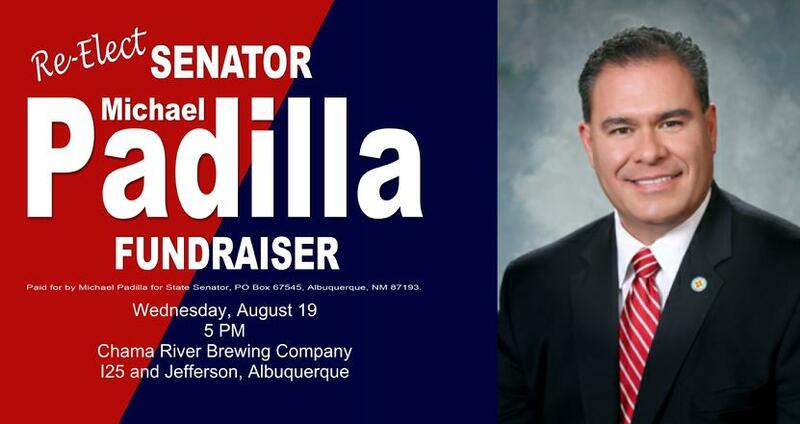 Albuquerque -Democrat Michael Padilla, candidate for state senator in district 14, announced that Sylvia Molinar has been named Campaign treasurer. Sylvia Molinar has been a longtime union member and official with Local 351, The Bakery, Confectionery, Tobacco Workers and Grain Millers International Union. Sylvia is also a Democratic Party activist and has lived in Pajarito on the southwest mesa for most of her life. 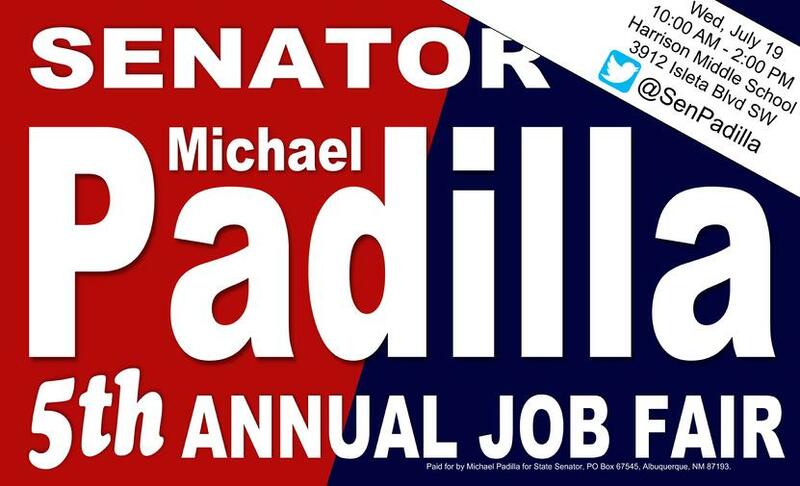 “Michael Padilla is one of the hardest working people I know, and I am proud to be a part of his grassroots campaign to protect worker and union rights, our schools, and our safety” said Sylvia Molinar. 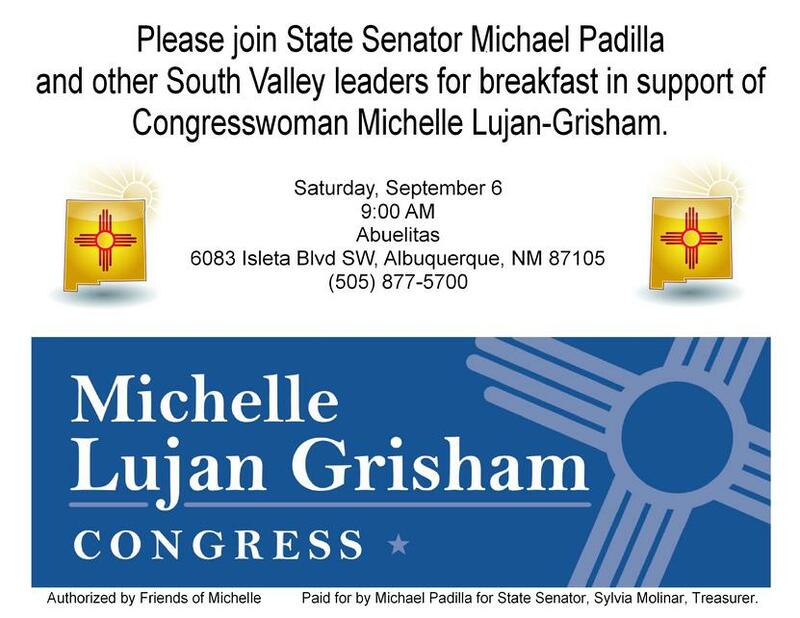 "I am so honored that Sylvia Molinar, a hard worker for working families in New Mexico, has agreed to serve as our campaign treasurer" said Michael Padilla. 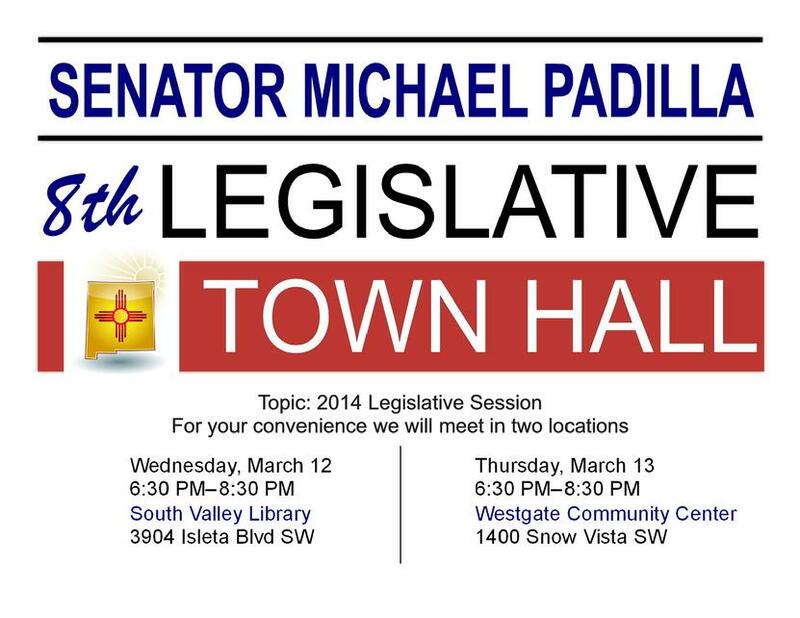 State Senate district 14 includes the South Valley, Southwest Mesa, and South Broadway areas. The boundaries of the district changed during the redistricting process. No republican filed to run for the open seat, so the winner of the June 5 primary will assume the office. 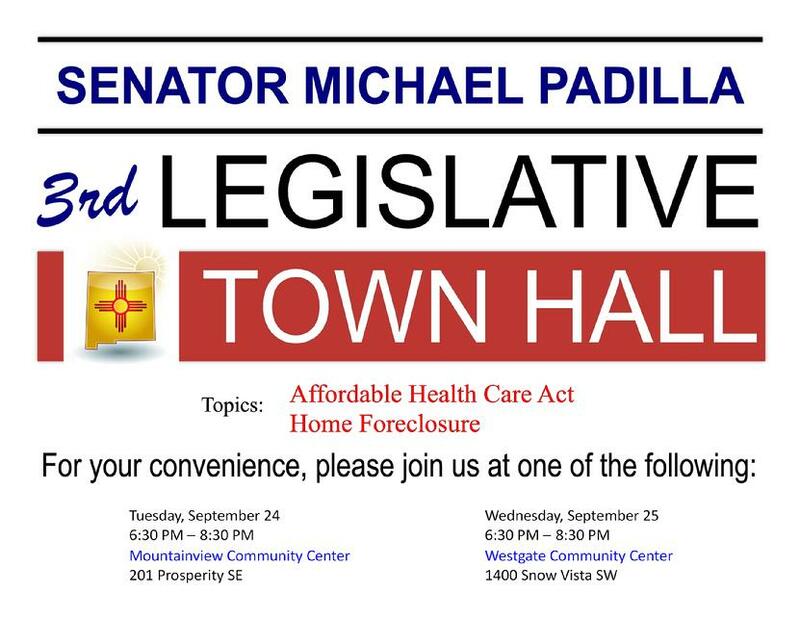 Help us move New Mexico forward by visiting us online at VOTEPADILLA.COM and CONTRIBUTING today. 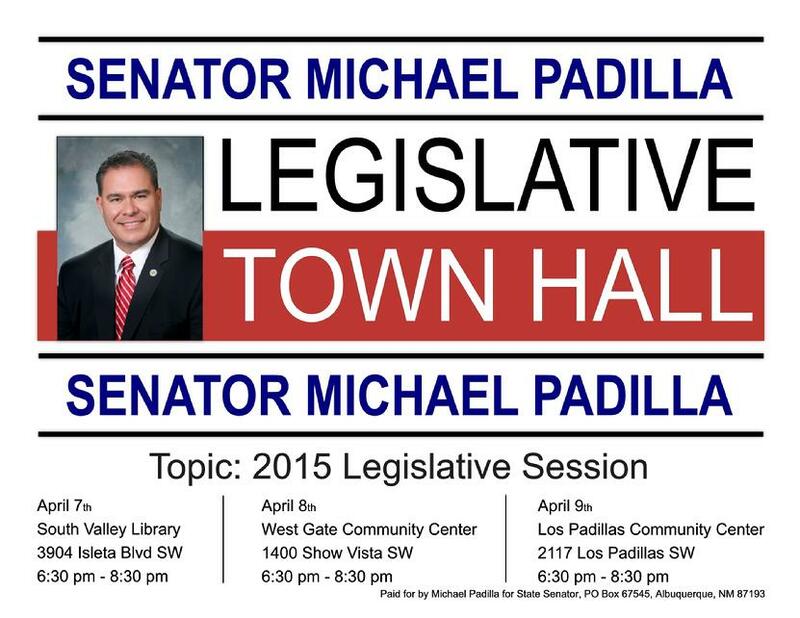 Many years have passed since state representative Kiki Saavedra began representing the South Valley. He is a leader and a fighter for New Mexico as chairman of the powerful House Appropriations Committee. 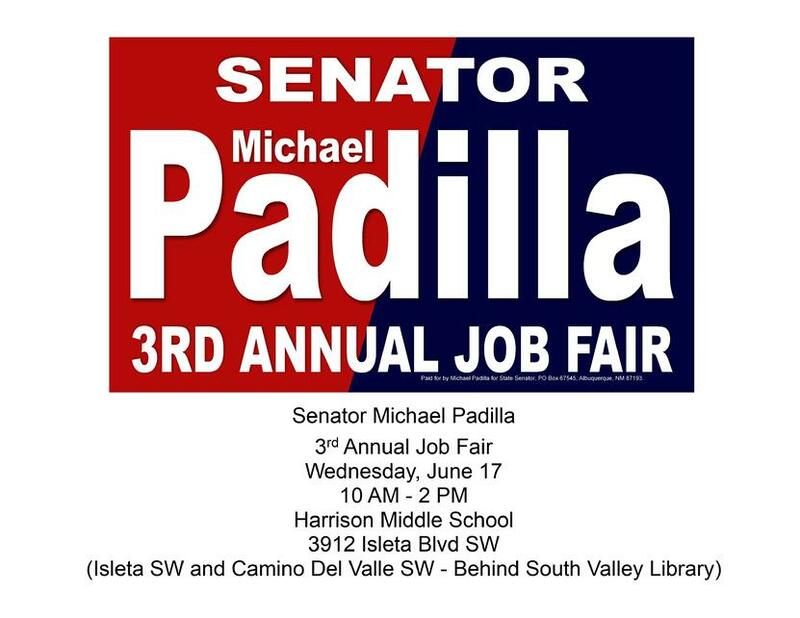 Chairman Saavedra said "Michael Padilla has the energy and passion that I have for the South Valley and will be a great parnter in the legislature." 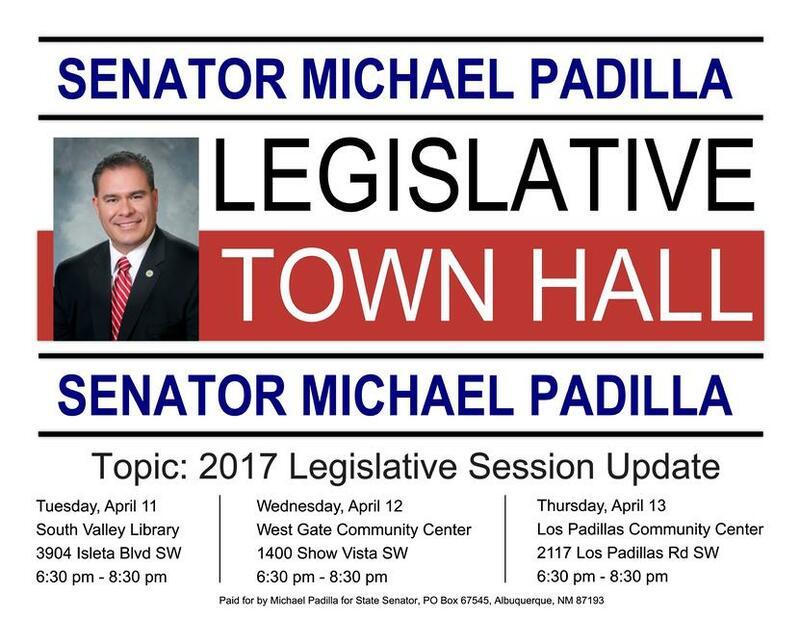 Michael Padilla announced his candidacy for State Senator in New Mexico's District 14. Saturday, March 3, over 350 people joined Michael at the home of his great uncle Julian Padilla and great aunt Susanna Padilla to share great food, talk with family and friends, listen to Mariachi Tenampa, meet Mrs. Bernaillo County Rachael Sweenay, and listen to Michael speak about his vision for the South Valley, Southwest Mesa, and South Broadway areas. 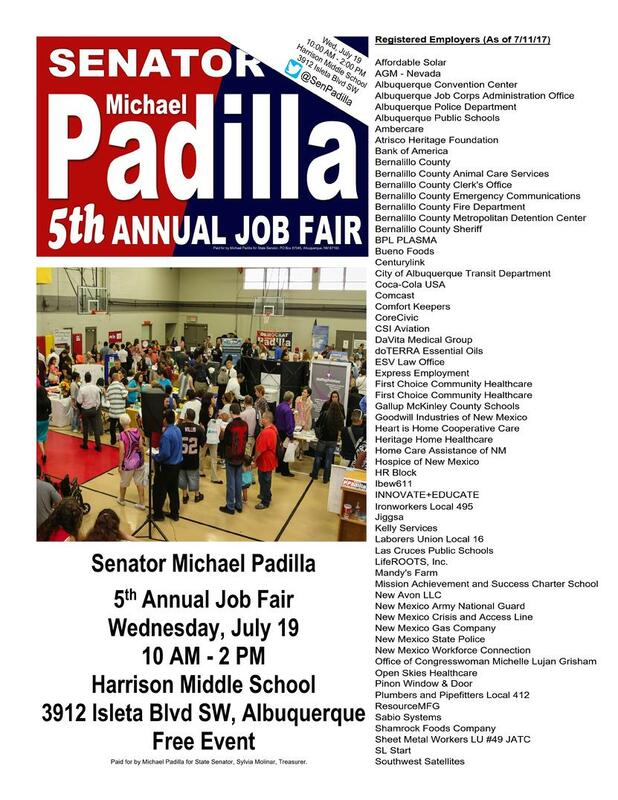 Michael spoke passionately about Jobs, Schools, and our Safety. 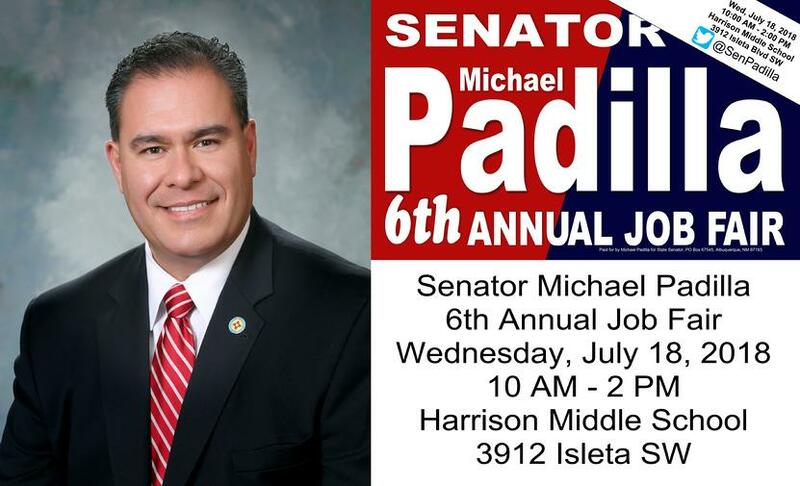 Michael was also endorsed in his candidacy by Ambassador Edward L. Romero, County Commissioner Art De La Cruz, State Representative Kiki Saavedra, Former Secretary of State Mary Herrera, Former Secretary of State Clara Padilla-Andrews, Former County Commissioner Steve Gallegos, Former County Commissioner Alan Armijo, Former State Representative Dan Silva, Former State Representative Delano Garcia, Former State Representative Clovis Herrera, Former State Representative Buddy Romero, and Los Padillas Neighborhood Association President Inez Aguilar. 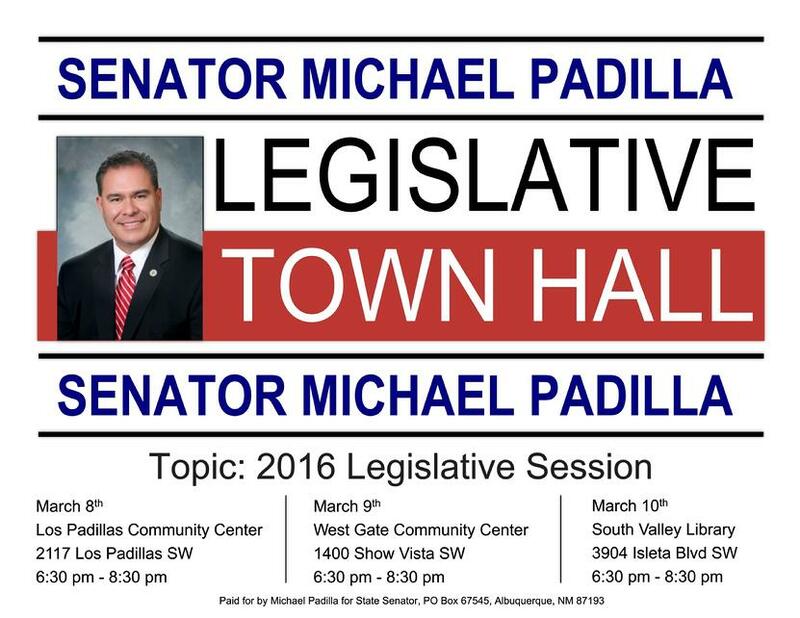 Learn more about Michael Padilla at votepadilla.com.